For most of us, the word ‘wearables’ conjures up images of gadgets strapped onto the body that might translate foreign languages for us, monitor our health stats, or help us to legally get high — or conversely, make sure we don’t relapse. But researchers from Massachusetts Institute of Technology and Stanford University are proposing a different kind of wearable — miniature, wearable robots capable of moving up and down your clothing, to be exact — which can run autonomously and perform simple tasks. Rovable bots would employ sensors that gather information that is processed by its artificial intelligence program. Each small robot consists of a 100mAh battery that can be recharged wirelessly, a microcontroller, as well as a wireless communications device that allows it to talk with a computer or smart device, as well as other Rovables. To help with navigation, there’s a low-power localization system with an inertial measurement unit (IMU) that incorporates an accelerometer and gyroscope. By tallying up the robot’s wheel revolutions, the IMU gives the mini-bot the ability to keep track of its own movements and positioning relative to that of other deployed Rovables. Testing shows that the bots are capable of carrying up to 152 grams and can run up to 45 minutes on a single charge of its onboard batteries. 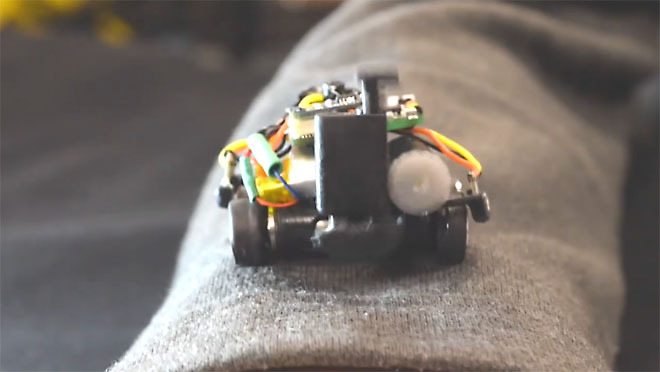 So what’s the point of having tiny robots crawl all over you? 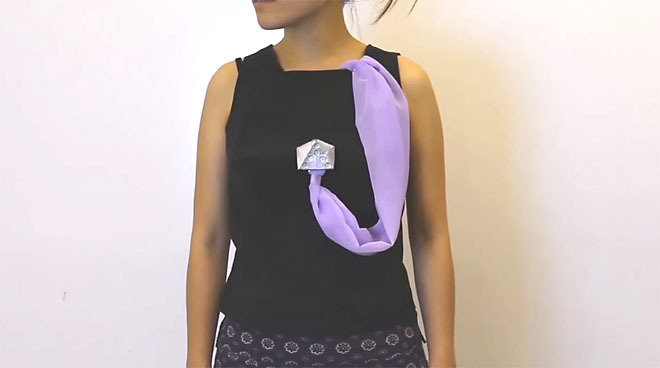 Well, ticklish factor aside, the researchers see this as a prototype for a new kind of mobile wearable that is not only ultra-portable but can also respond to its surroundings. In their paper, recently presented at the User Interface Software and Technology Symposium in Tokyo, the researchers wrote that they “envision that future wearable technology will move around the human body and will react to its host and the environment”. In particular, they believe these mobile devices can provide a new kind of on-body sensing, a potential boon for medical applications. A group of Rovables could emerge out of your clothing’s pockets, either to nudge you or assembling to create modular displays, perhaps to alert you of an important message, or to create a screen for a GPS system to help you navigate home. 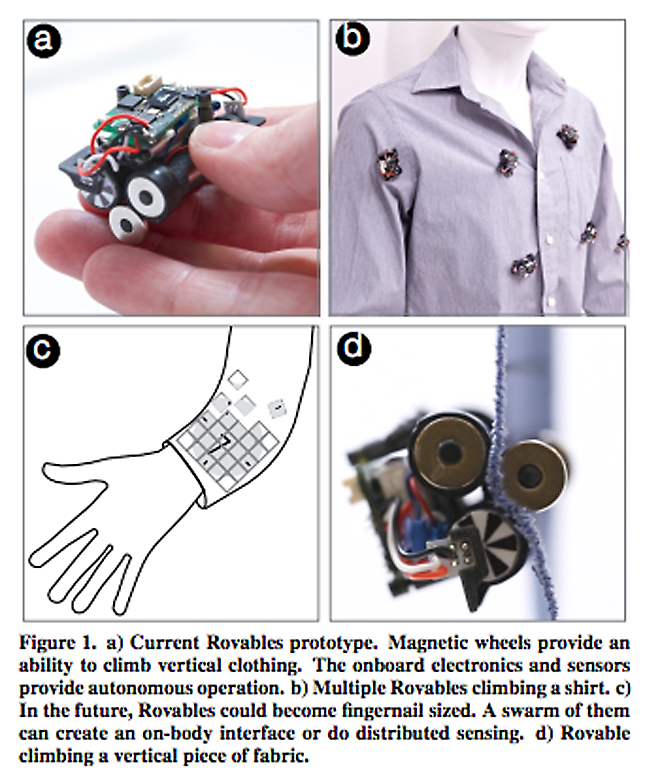 A bunch of touch-sensitive Rovables could provide an interface and tactile feedback for connected applications. Voice-activated, wearable mini-robots could offer more autonomy and accessibility to disabled users who might not have full use of their limbs to control their devices. As the team’s video suggests, these little machines could even help you get dressed. Rovables would be the diminutive, clothes-maneuvering version of larger, wearable robot exoskeletons that are already giving paraplegics the ability to walk and play sports. As one can see in the video above, a handful of Rovables, programmed to sew, could mend clothes automatically, allowing us to keep and maintain our wardrobe for longer periods of time. 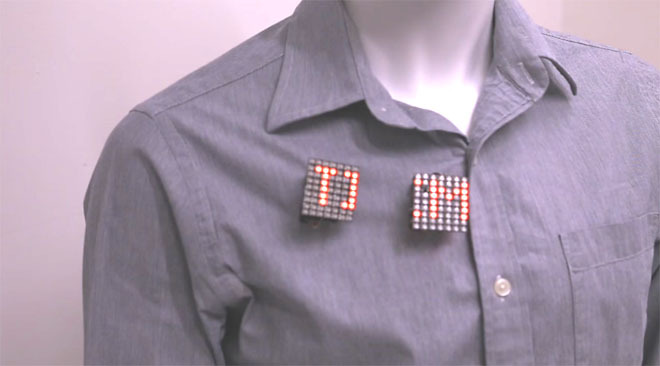 Rovables could also be programmed to be pieces of dynamic, interactive, shapeshifting jewelry: brooches that double as displays or microphones to one’s smartphone. For now, the researchers are working on improving the Rovables’ navigation system in three dimensions. They are aiming to construct a microcontroller powerful enough to process the computations necessary for that task. In the future, the researchers foresee the development of fingernail-sized, multipurpose tiny Rovables that would dynamically assemble to form a kind of “ubiquitous computing” scenario — little pieces of technology that are not obtrusive, and which could potentially use a smartphone as a server and charging station, but would present themselves when they’re needed. It’s a fascinating — if potentially skin-crawling — concept.